New Year’s Eve, 2001, West Chicago, IL. Twenty hundred hours. Bemis’ motorbike wouldn’t start. He pushed it up the hill. He rode it down the hill. It burped a couple times. Back up the hill. Then down the hill. Burp. Then up. Then down. Burp. Up. Down. Burp… That’s how Bemis ended up recording these songs from 10:00 pm, December 31st, 2001 through about 6:00 am on January 1st, 2002. You could say it took him two years. You would be wrong, though. All it really took him was a shot of Glenlivet, two microphones, one pipe of tobacco, eight hours, a class of champagne, a guitar, another pipe of tobacco, and a couple cups of coffee. Turned out a couple days later Bemis just hadn’t opened the choke all the way on the motorbike. 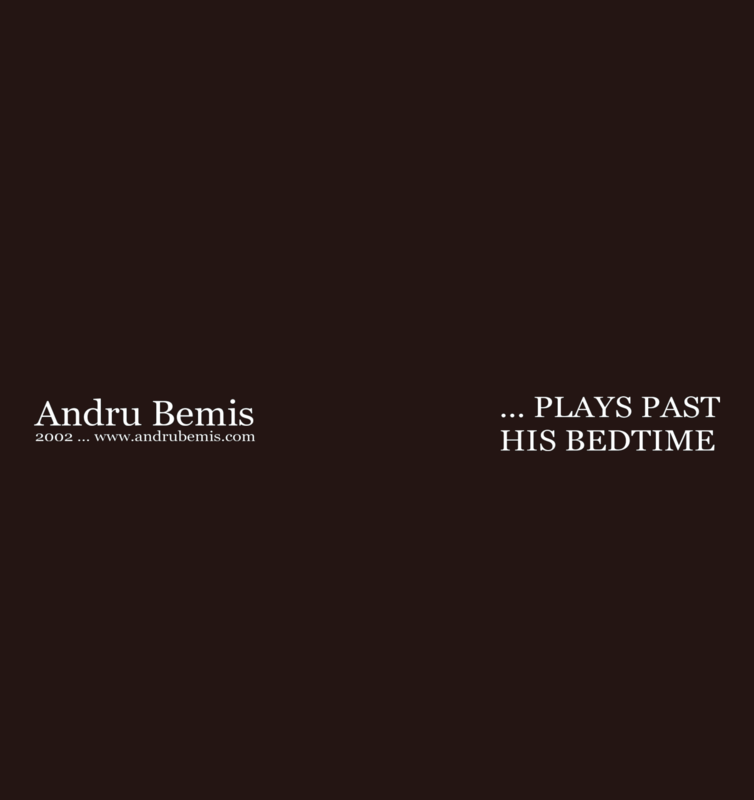 Recorded, mixed, and mastered by Bemis. 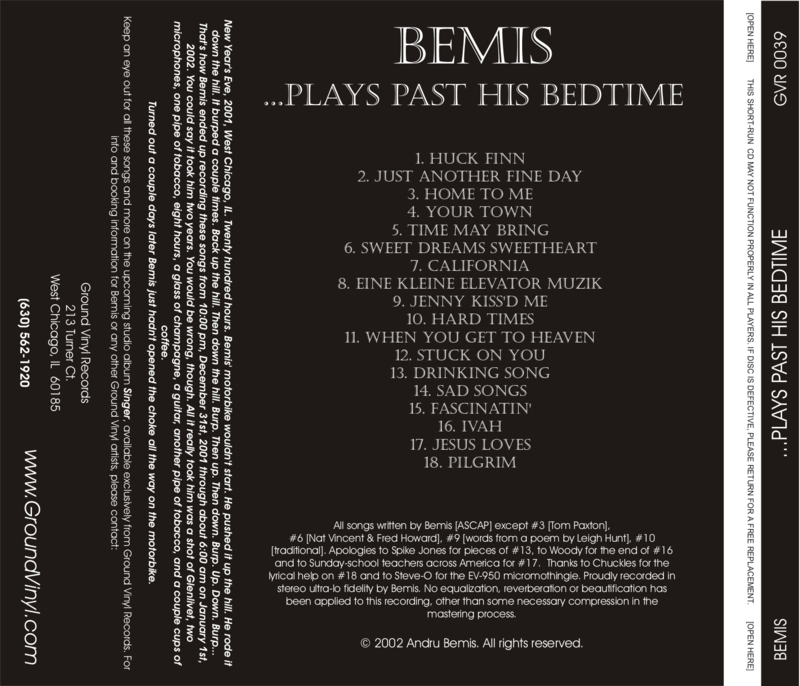 All songs written by Bemis except #3 (Home To Me), Tom Paxton; #6 (Sweet Dreams Sweetheart), Fred Howard & Nat Vincent; #9 (Jenny Kiss’d Me), lyrics by Leigh Hunt; #10 (Hard Times Come Again No More), Stephen C. Foster. Apologies to Spike Jones for pieces of #13, to Woody for the end of #16, and to Sunday school teachers across America for #17. Thanks to Chuckles for the lyrical help on #18, and to Steve-O for the EV-950 micromathingie. Proudly recorded in stereo ultra-lo fidelity by Bemis. No equalization, reverberation or beautification has been applied to this recording, other than some necessary compression in the mastering process.